MISSION, KS--(Marketwire - Nov 1, 2012) - (Family Features) Looking to impress your guests this party season? Treat their taste buds to a pork loin dish that is as versatile as it is delicious. This Simply Saucy Bacon-Wrapped Pork Loin is sure to be a crowd pleaser since, after all, everything is better when wrapped in bacon. This delectable dish offers a new and memorable approach to standard party food with four different accompanying sauces to suit any party goer's palate. Add a fruity twist with crushed pineapple sauce, or spice things up with a kick of jalapeño chilies. Go savory with a touch of Dijon, or smoky with chipotle chilies in adobo sauce. Whatever type of event you are planning, your guests will leave with mouthwatering memories. 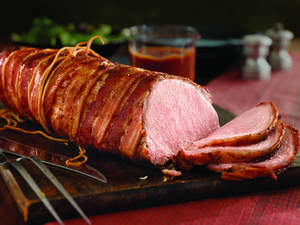 For more seasonal inspiration and pork recipes, visit the National Pork Board at www.PorkBeInspired.com, www.Facebook.com/PorkBeInspired and www.Pinterest.com/PorkBeInspired. Also, be sure to follow @allaboutpork on Twitter for timely recipes and tips. Skim fat from pan juices, leaving browned juices in pan. Add barbecue sauce and preferred ingredient (*see below) and bring to simmer over medium heat, stirring to loosen browned bits in pan; simmer 2 minutes. Remove strings, carve pork, and serve with sauce. • Spicy: Stir in 2 tablespoons pickled jalapeño chilies (nacho sliced), drained and finely chopped, into the sauce.